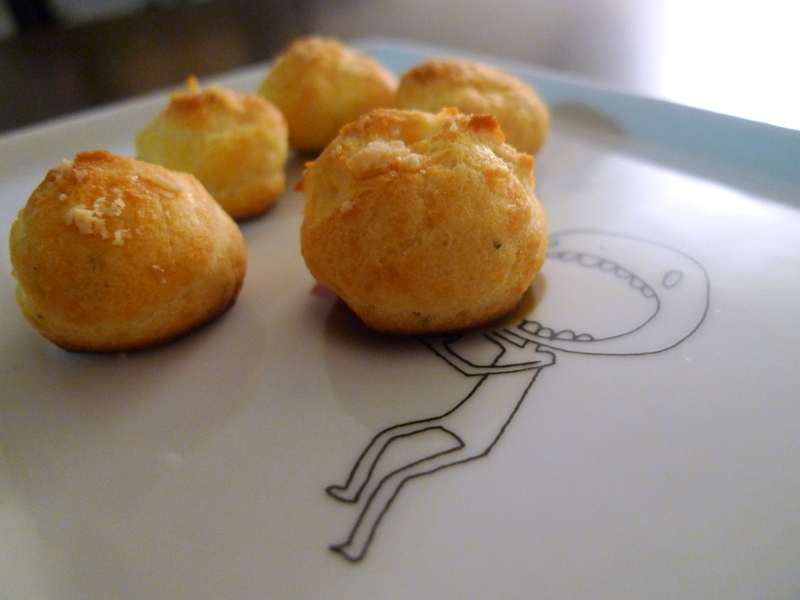 Ever since tasting my first gougères , I have been addicted to these delightful, savory cheese puffs. 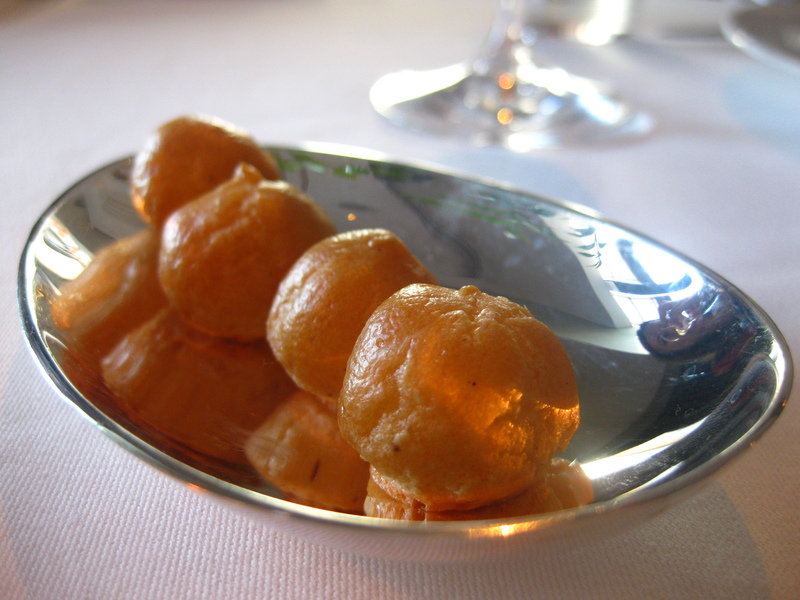 A gougère is a classic French choux pastry made with cheese that originated from the Burgundy region. 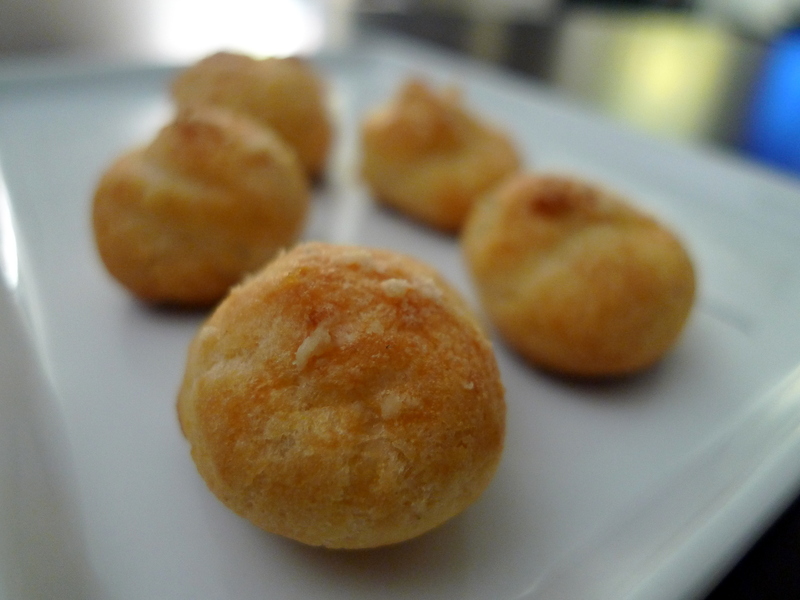 Traditionally, gougères are made with Gruyère cheese, but any other hard, sharp cheese can be used (Comté, Emmental, Parmigiano-Reggiano). These savory puffs can also be filled with other ingredients, such as mushrooms or meat. Considering the first times I had tried gougères were at such fancy restaurants such as Per Se and Eleven Madison Park, I assumed making gougères myself would be far beyond my ability. However, I stumbled upon a recipe on day and was surprised how easy it could be! Additionally, most of the ingredients were ones I normally had on hand, and so I decided to give it a whirl. 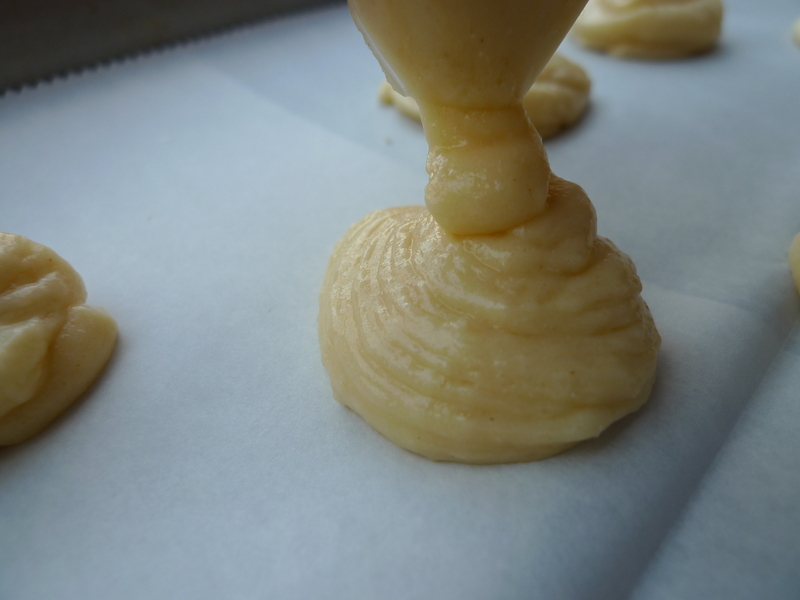 Troubleshooting: The most common problem folks have with pâte à choux, or cream puff dough, is deflated puffs. The usual causes are too much liquid (eggs), or underbaking. Make sure to use large eggs, not extra-large or jumbo, and use a dry, aged cheese, if possible. 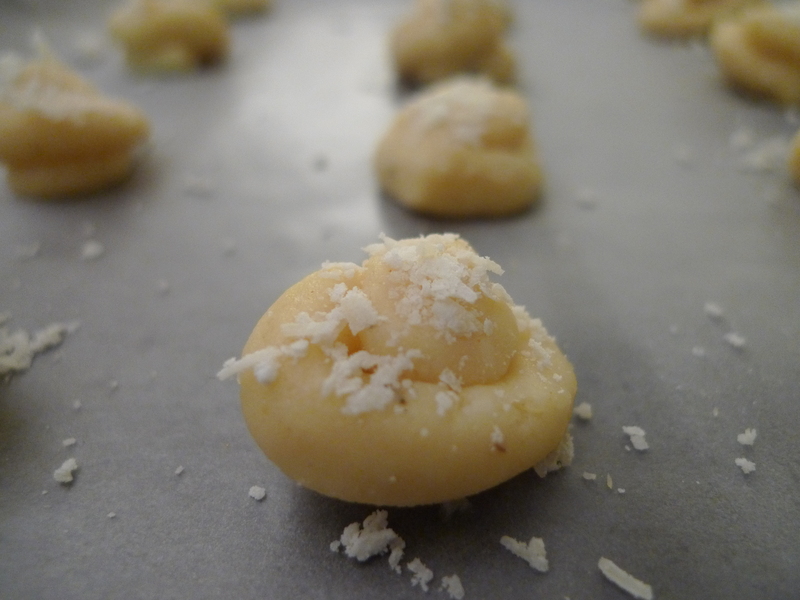 And bake the puffs until they’re completely browned up the sides so they don’t sink when cooling. If yours do deflate, that’s fine. I’ve seen plenty of those in France, and I actually think the funky-looking ones have a lot of charm—and you’re welcome to quote me on that. With David’s advice, I was able to finally make proper puffs that were perfectly rounded, although I still had a few funky-looking ones… but as David said — they were very charming! Heat the water, butter, salt, and pepper in a saucepan until the butter is melted. Add the flour all at once and stir vigorously until the mixture pulls away from the sides into a smooth ball. Remove from heat and let rest two minutes. Add the eggs, one at a time, stirring quickly to make sure the eggs don’t cook. If you have an electric mixture, mix on medium high until mixture is smooth and shiny. 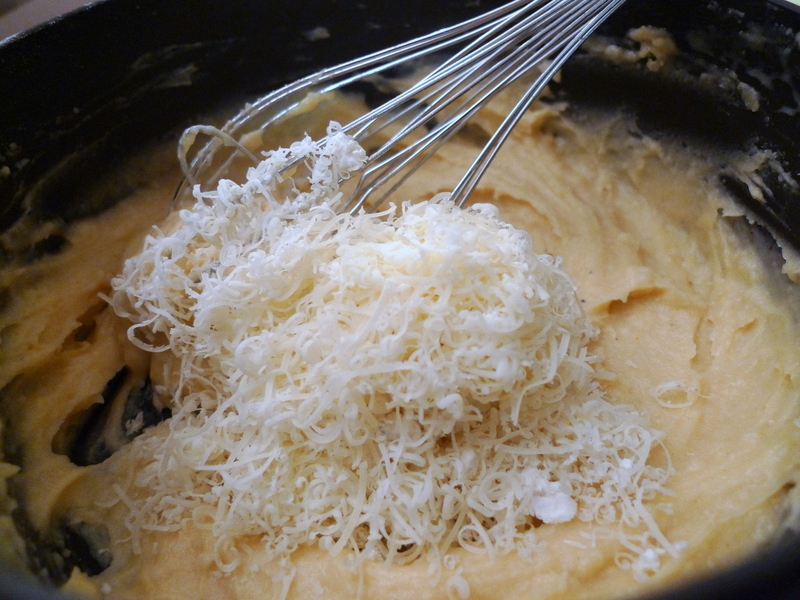 Add 3/4 C of the grated cheese and fresh herbs, and stir until well-mixed. Scrape the mixture into a pastry bag fitted with a wide plain tip and pipe the dough into 1 inch rounds, each about 1/2 inch high (about the size of a small cherry tomato). 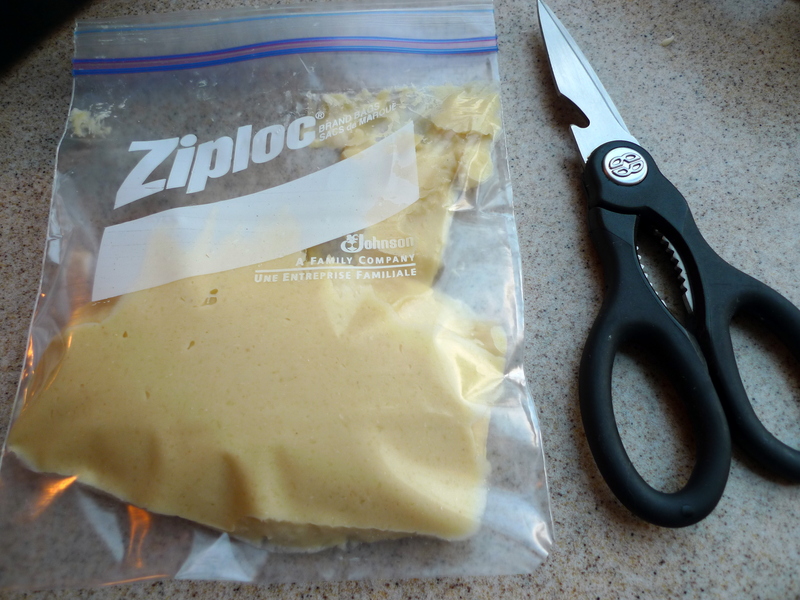 If you don’t have a pastry bag with a plain tip, you can put the dough into a freezer bag and snip off a corner. Each baking sheet should fit 25 gougères. 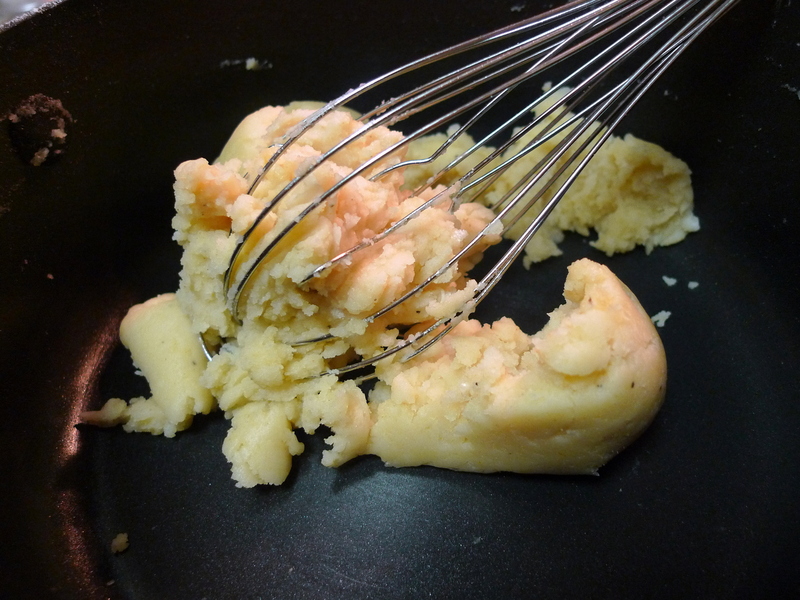 Optional: Brush the gougères with the heavy cream or egg wash to give it a nice golden-glazed look. Because I had only extra-large eggs on hand and after the warning David gave to not use too much liquid, I decided to only use 1 1/2 of my extra large eggs and I ended up using the remaining 1/2 egg to glaze the puffs. Top each puff with the remaining cheese. Bake for 10 minutes, then turn the oven down to 375ºF and bake for an additional 10-15 minutes, until they’re completely golden brown. For extra-crispy puffs, 5 minutes before they’re done, poke the side of each puff with a sharp knife to release the steam, and return to the oven to finish baking. Gougères are best served warm. You can make and refrigerate the dough up to three days in advance, or bake the gougères ahead of time. Cover the cooled puffs loosely with paper towels or leave them open to the air to retain maximum crispness, then reheat them in a low heat oven for 10 minutes before serving.